HCS Pharma developed and validated these different assays in an automated fashion on HepG2 cells. They can also be performed on primary cells and other cell lines. DNA double-strand breaks (DSBs) may be encountered in response to exogenous stimuli; they are triggered either by ionizing radiations or DNA-damaging chemicals. In response to DSBs, H2AX is phosphorylated within minutes at Ser 139, and is then referred to as γH2AX. 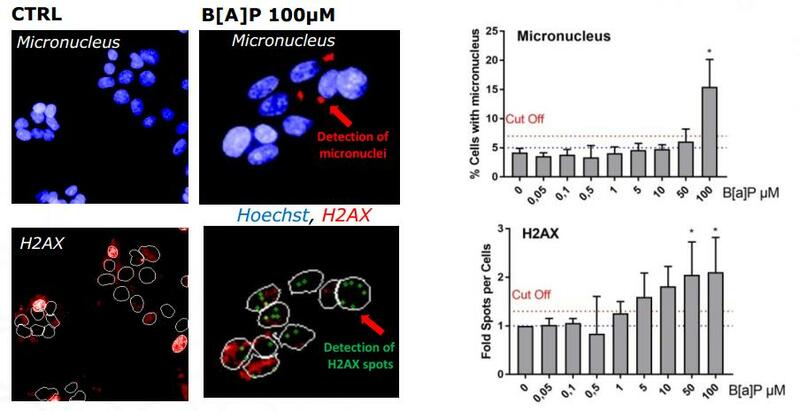 This assay can be multiplexed to look for 53BP1/γH2AX colocalization. Don’t hesitate to ask for our short report on HepG2 cells exposed to our in-house genotoxicity library ! Distinguishing aneugenic (chromosomes loss) from clastogenic effects (DNA damages) is essential to assess genotoxic properties of compounds. In response to a clastogen DNA double strand breaks (DSBs), H2AX is phosphorylated within minutes at Ser 139, and is then referred to as γH2AX. Detection of γH2AX spots allows to determine specific DSB unrelated to unspecific phosphorylation (e.g. apoptosis). Contrary to γH2AX, micronuclei are a late marker of damages to the DNA and can be related to aneugenic and clastogenic effects. Histone H3 is phosphorylated during mitosis and is referred as γH3. Aneugenic compounds induce phosphorylation of H3 due to mitosis arrest, and confirm micronuclei detection. By detecting both dual γH2AX/γH3 staining and micronuclei on our high content screening platform, our assay provides an efficient tool to assess the genotoxic properties of your compounds. This assay is validated on HepG2 cells exposed 24 hours to compounds from our in-house genotoxicity library. Cell line stability was assess on 4 passages and experiments were performed thought a biological triplicate. We detected 100% and of the clastogen tested. And 75% of the aneugen tested were statistically positive for micronucleus detection. Exemple of BAP : HepG2 cells were exposed 24 hours to increasing concentrations of Benzo[a]pyrene (B[A]P). The comet assay is a sensitive, well-established technique for quantifying DNA damage in eukaryotic cells. Compatible with the detection of a wide range of DNA damaging agents, its consists in making fragmented DNA migrate in an electrophoresis gel; while damaged DNA forms the tail of the comet, intact DNA moves at a slower rate and forms the head of the comet. The percentage of fragmented DNA in the comet provides a direct measurement of DNA damage. 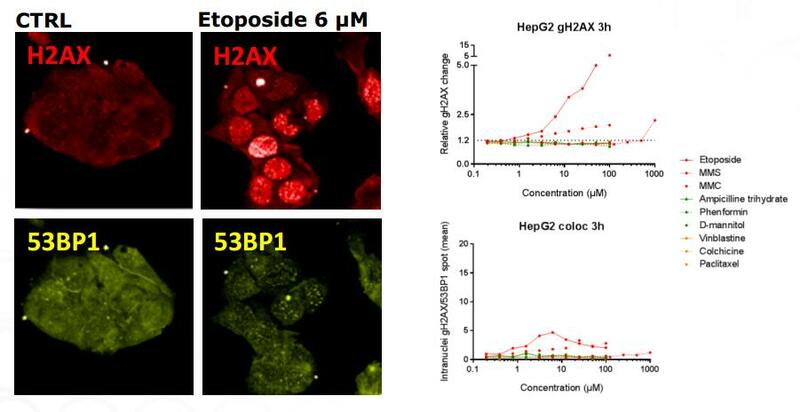 HepG2 cells were exposed for 3 hours to increasing concentrations of Etoposide.